Despite the fact that our plans for moving are still up in the air I’ve been working on what I can so we’re prepared to move forward (no pun intended) when the time comes. Because I can’t just start packing things willy-nilly, I’ve turned my attention to creating a Move Planner. 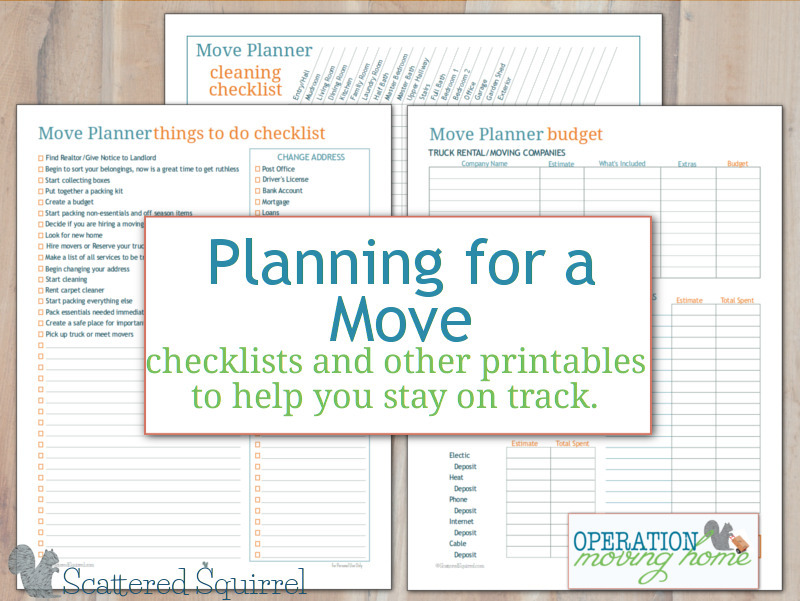 I’ve already shared a few of the printables that I’ve made or updated, including ones for house hunting and ones for planning your move, and today I want to share with you a few more move planner printables with you. 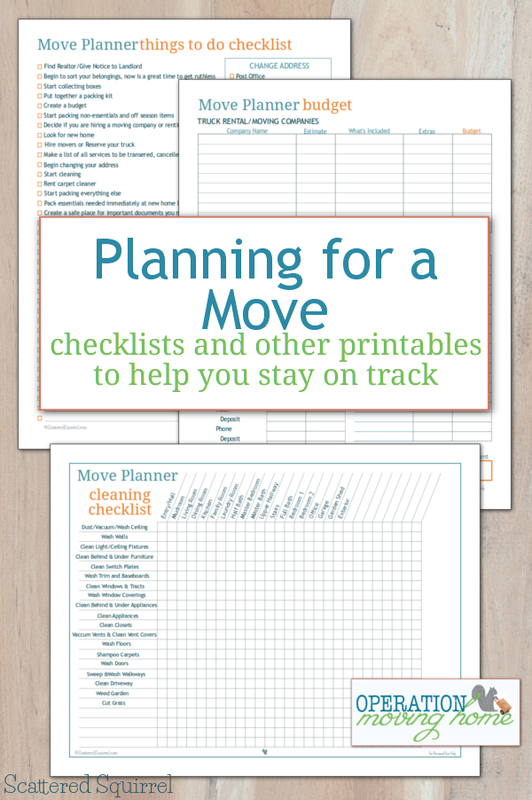 Use the move planner printables to organize your move. Planning a move can be a lot of work, in some ways I think the planning is more work than the actual move itself. Because I tend to be scatter-brained it’s really important to me that I have one place where I keep everything move related. This way I’m not hunting for scraps of paper that I’ve jotted the important details down on. I know myself well enough to know that if I don’t have it written down, I won’t remember it. So I turn to the tool I know and love best and made up some printables to help me keep everything together in one place. 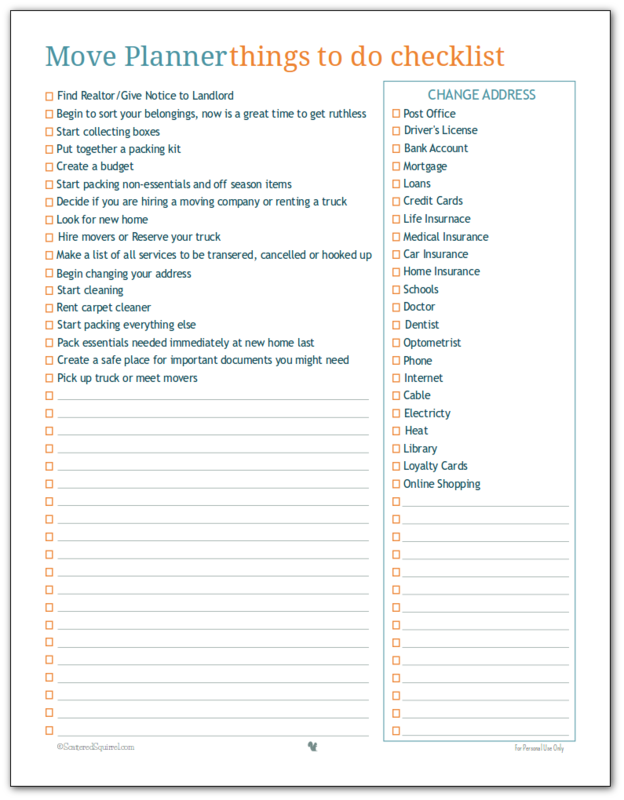 There are always lots of little things to do when you move, especially the dreaded changing of the address, so the first printable I’m sharing today is my Move Planner Things To Do Checklist. When it comes to moving everyone has their own way of doing things. I tend to keep track of the day to day to-dos in my planner, but I thought it might be nice to have a small list of general things that need to be done with room to jot down other items as they pop up, because something always pops up. By far, the biggest, most challenging task of any move for me is changing our address. Because you have to change it everywhere! Driver’s license, doctor’s office, bank… well you can see from above that the list is pretty long. With more and more bills and statements being delivered online, it’s not quite as urgent as it used to be, but it’s still important to remember to change your address with all the companies, services, subscriptions, etc… that you deal with. Hopefully, this list will help keep track of which ones have been changed. Moving is not cheap! Though there are plenty of ways you can save money when moving, it is still really important to have an idea of how much it’s going to cost, so I created a move budget printable to help keep all numbers in one spot. We tend to by DIY movers, and always rent a truck and do the moving ourselves, but I know that there are many people out there who hire a moving company. With that in mind I dedicated the top portion of this printable to comparing quotes from moving companies or different truck rental places. There is room to keep track of the estimate from the company, what’s included in that, what is going to cost extra (if you’re renting a truck, mileage might be an extra cost to consider) and what your final budget is for each one. I always like to add 10%-30% to my budget just in case something unforeseen arises. 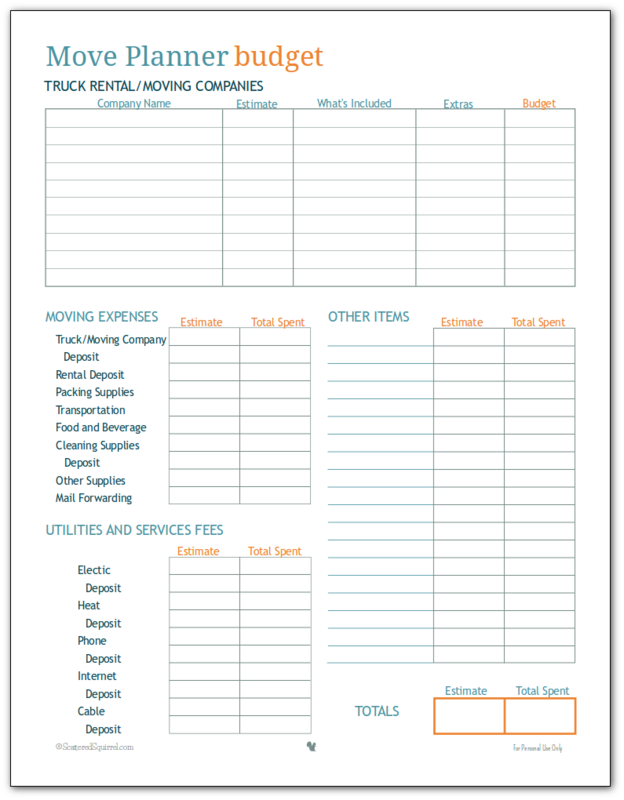 The rest of this move planner printable is just a simple budget tracker, with room for you to record what you estimate the cost will be as well as what you actually had to spend. This one is especially helpful for renters, but even if you’re selling your home, giving it a good thorough cleaning before you leave is always a good idea. 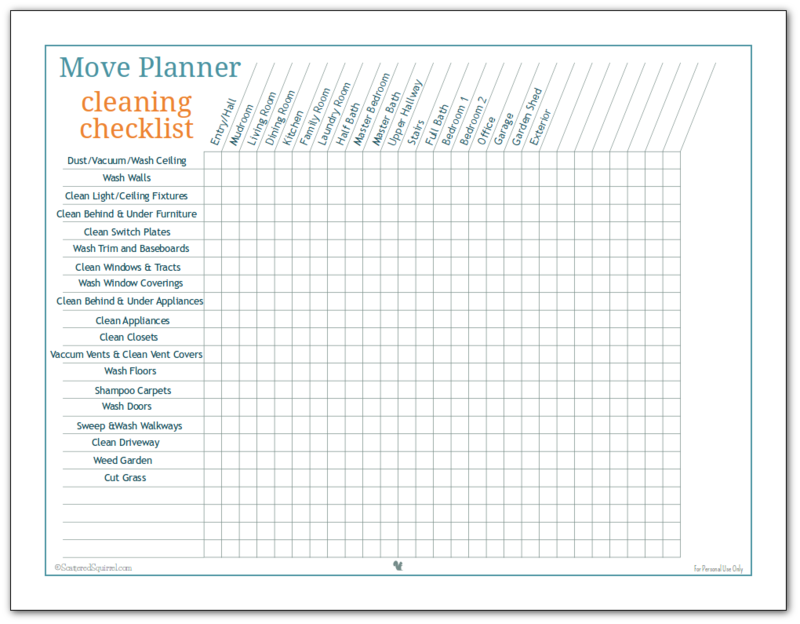 I used my spring cleaning checklist to create this one. I added in a few spaces at the top as well as a few extra tasks down the side. Cleaning when you move out of a place is very similar to spring cleaning so I opted not to reinvent the wheel, just changed it up a little to match the rest. If you’re looking for more ways to stay organized this collection of 25 Must Have Printable Organizers is a great place to start. Now that I’ve finished making and updating the move planner printables, I think I’m ready to put this planner together. When I get it finished I’ll share it all with you, I promise. For now, I’m off to print these out and see if I have all the rest of the supplies I need. I hope you all are having a wonderful week! Inquiring minds want to know – what’s your best moving tip? Love these! Especially the list of who to tell about your change of address. I thought I had everyone when we moved but it turned out I missed the cat insurance off the list and so of course my policy lapsed and they refused to reinstate it – evil people – I was heavily pregnant with twins and my brain cells had gone on holiday! Oh well. Next time thanks to you I’ll be better prepared! Yes, that list of who to tell is because last time we moved I forgot many of them for months (if not a year – oops) Oh that sounds horrible, they like to make things difficult don’t they? Wow, these look like a great resource and sooooo much more organized than I am naturally inclined to be! Thank you for sharing at the #HomeMattersParty with us! Thanks for putting on a great party! I honestly think moving requires more organization than setting up house does. lol Or at least it feels like it at times. Love that you included a moving budget and a cleaning list. I love to share resources like these with my clients (I’m a Realtor). I’ll definitely be adding this to an upcoming round up of my favorite moving tips! I’m happy to hear that you find them useful, they’ve been really helpful for us when we’ve moved. Thanks so much for sharing. Thank you Ali! We are moving in August and still don’t know where exactly. My husband sent out applications and we’re waiting to hear back from one of them about a position. We are moving regardless.. So, here we go! I’ve been feeling very energized to get started moving, but haven’t known how to prepare. 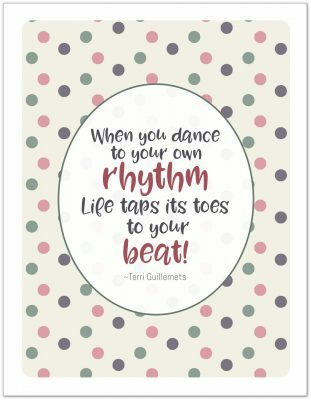 Your planner printables help me pull together my ideas and give me something to work toward. There’s a lot I can do before we even get to the actual move day. Thank you! Thank you soooo much for all this help!!! This is the best help I have been able to find! Love it!! I’m so glad you found the move planner printables helpful.